Morosenii, as the people of Maramures call themselves, are a hospitable people who like company and talking. The old habit of greeting everyone, originating from the times when people of the same community were few and the strangers even fewer, continues today: when two people meet they greet each other, be they acquaintances or complete strangers. 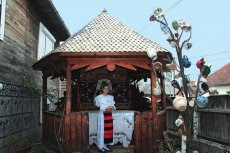 Maramures is one of the few zones where the folk costume has been preserved almost unaltered by urban influences. And although it can be admired only on Sundays when Morosenii go to church, or on the occasion of religious feasts and great fairs, each Morosan, without exception, owns a traditional costume. At the fairs the alimentary habits of the Moroseni are revealed. The food markets are practically invaded by milk products, especially sheep-milk and cow-milk cheese, between May and the end of September, sometimes even later. The soft cottage cheese and the green sheep-milk cheese are eaten all through the warm season. During this period sheep-milk is full of fat due to pasturing on the slopes of the mountains. The herds are taken to the mountain pastures on St. George (26 October) and back to the valleys on St. Demeter (23 April). Making cheese is a way to preserve excess milk for the cold season. Another staple food of the Maramuresean diet is pork meat. On each farm, one week before Christmas, a pig is slaughtered, an event in which the whole family takes part. After the butchering, the pig is singed, cut to pieces, and various specialities are prepared (sausages, bacon etc. ), all smoked to conserve them for the winter. Maramuresean people are great eaters of onions, garlic, cabbage and potatoes, which are all cultivated in the region. Old documents tell of agriculture around the villages, and most probably the people got their livelihood combining farming and herding. Maramures is a civilization of wood, made obvious by the splendid wooden churches and the numerous buildings of lay architecture. Even though life in Maramureş is adjusting itself to modern times, some elements are preserved unchanged, which is a proof of a strong collective mentality. The inhabitants of Maramures, being animal breeders par excellence, and especially sheep breeders, have preserved until this day the ancient ways of processing textile fibres. The long work of wool processing starts in May, when shepherds shear the herds in their care. The wool is then washed, dried, carded and stored. Once the agricultural season comes to an end with the completion of fieldwork, women start the real processing of wool: spinning the wool with a distaff, then weaving and thickening the cloth in whirlpools. Each woman of Maramures has in her household a loom, which finds its place in the kitchen during the winters. In Maramures, the loom is used to make cergi (long-haired blankets), carpets, bags and panura (thick cloth used to make warm winter clothes: sumane (long winter coats), gube (short winter coats), and trousers. In most cases the blankets and cloths are dyed with industrial pigments, bought from the market, but bags and carpets are often dyed using old recipes for preparing natural vegetable dyes. Thus, nettle is used to get green colour, birch bark for black, onion for ochre and buckthorn for brown. Weaving and spinning are occupations that only women – and all women – take part in, and a series of ancient beliefs and taboos are still alive today.The stills for making horinca are masterpieces of traditional metallurgy. Made of copper beaten with hammer, and then joined perfectly together with rivets, the stills have a capacity varying between 100 and 500 litres. They are equipped with a mixer, whose action depends on a water wheel, to stir the fruit. The still is placed atop an open hearth, where a hot fire is maintained, necessary to the distillation of the fruit to obtain the drink. There are two periods and, implicitly, two types of drink that can be obtained: the horinca made at the end of summer with plums and the apple rachiu made in spring. Ceramic ware is still produced and used throughout the region of Maramures. The ware is made in various shapes and sizes, depending on the intended use. The colours are vivid greens, reds and blues on a whitish background. If one wants to see the only place in Europe where unglazed red ceramic ware is still produced, then they should go to Maramures, towards the source of Iza River. All steps have been preserved in an unchanged form: the manner of preparing the clay, which is by first treading it with feet and then pounding it with wooden hammers, the shapes of the pots, the preparation of the pigments by grinding rocks containing iron oxides, the polishing with river stones, the painted decorations, the shape of the oven, and the firing techniques.